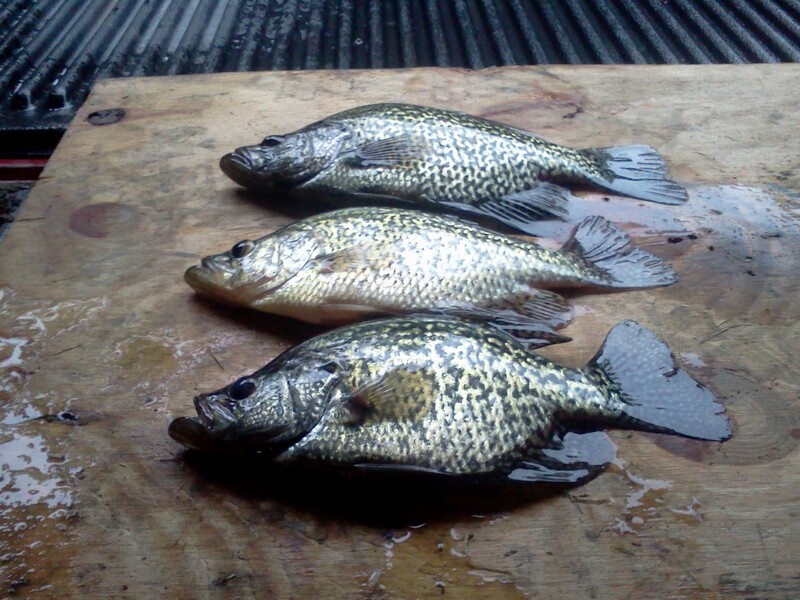 5-29-12 – Thunder and Lightning Crappies!!!! I got out of work early yesterday due to a bomb threat so I called some buddies and we went to check out a crappie bite that had been hot recently. The weather was bad, hit or miss thundershowers all day. I looked at the radar and the closest storm was over the great lakes so I thought we had some time to get a few hours in. I picked up my buddy and his boat and headed to the lake. We got to the lake at 1 pm and noticed some blackness overhead so we waited 15 minutes for a storm to blow over and we hit the water. I was very familiar with the bay that we were on. I had spent many hours ice fishing this bay on my own and also during the VT Sportsman tournament series. 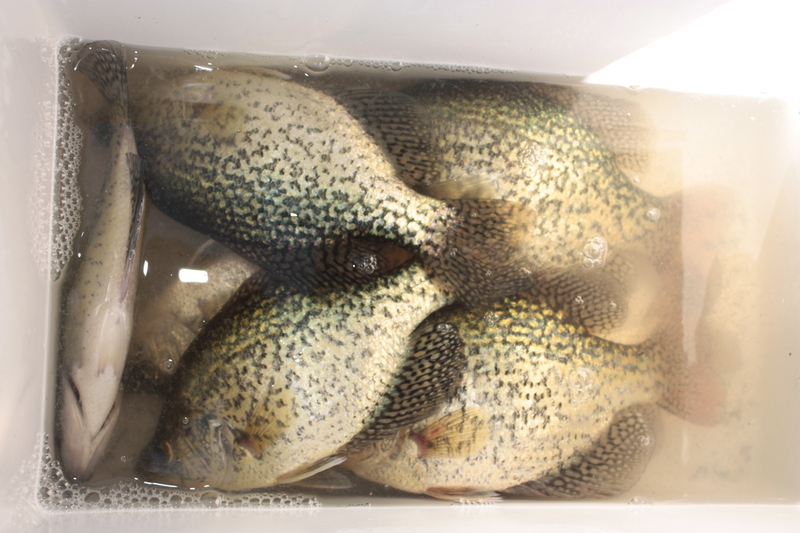 The bay is notorious for holding large numbers of gills, seeds and crappies during the winter but it’s usually only a staging area for them. The fish were there now and we had to find them. The bay is nothing more than a larger 6-8′ flat with pockets of weeds. Once you found the weeds you found fish. A good graph would be key or in our case the Navionics app on my phone pointed us in the right direction. It was not a good day to be bobber fshing. The wind was blowing about 15mph from the south and boat positioning was an issue. The wind also created some decent sized waves with white caps that I think was spooking the crappies away from our baits. We managed to find a school of fish and I caught two decent crappies right off, but the anchor didn’t grab and we lost them. Why were these fish here? Well this is my theory. We have had a really dry spring here in Vermont. These fish usually head for one of two near by creeks to spawn. I don’t think they ever made it due to the lake level being so low. I think these fish decided that it would be better to save their energy and spawn in the shallow weed beds and stick marsh of the bay. Hopefully they make this decision for years to come! Back to the fishing. The three of us tried lots of different baits to try and get the crappies to bite. The two most successful baits were the Berkley Gulp Minnow , and the Bobby Garland Baby Shad rigged under a bobber on a 1/16oz jig. The bite slowed but I had another theory that payed off. We were catching white perch one after another and they were feeding aggressively. We see this a lot in the winter with the gills and seeds in which their feeding activity actually causes the crappies to bite less or the fact that they are lazy and the seeds and gills beat them to the bait. Another factor working against the crappie on this day was the weather. 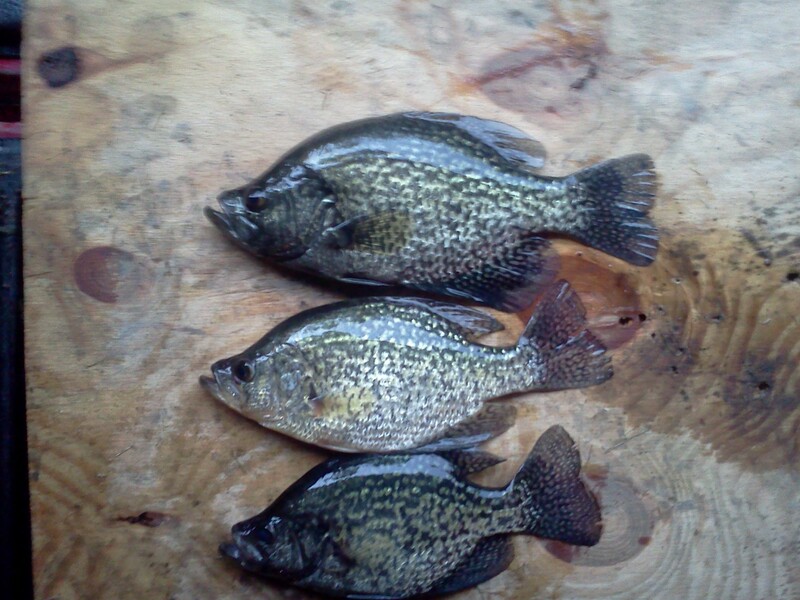 The waves were big, and the lake was churned up and the crappies were laying in the weeds on the bottom. I took my bobber off and decided to slow role my jig tipped with the Gulp minnow. First cast I pulled a nice 12″ crappie. I would cast out, count to 7 figuring a 1′ drop per second, and then slowly swim the jig through the weeds. This got the bait below the white perch and into the crappie laying in the weeds on the bottom. We ended the day boating some nice fish and running away from another big thunderstorm. I kept a few for dinner and that’s that. Had a few hours to wet a line last night. Conditions were tough on Lake Champlain. I was greeted on arrival by a steady 15-20 mph North wind. Normally, this isn’t an issue since you can position the boat in a way that the wind can aid you, this outing however was from shore and I was fishing I had to cast directly into the wind. Apparently, the fishing had been slow until I got there, guess I brought the lucky horseshoe. We were casting to about 8-9 feet of water, well if you could reach it with the wind blowing. 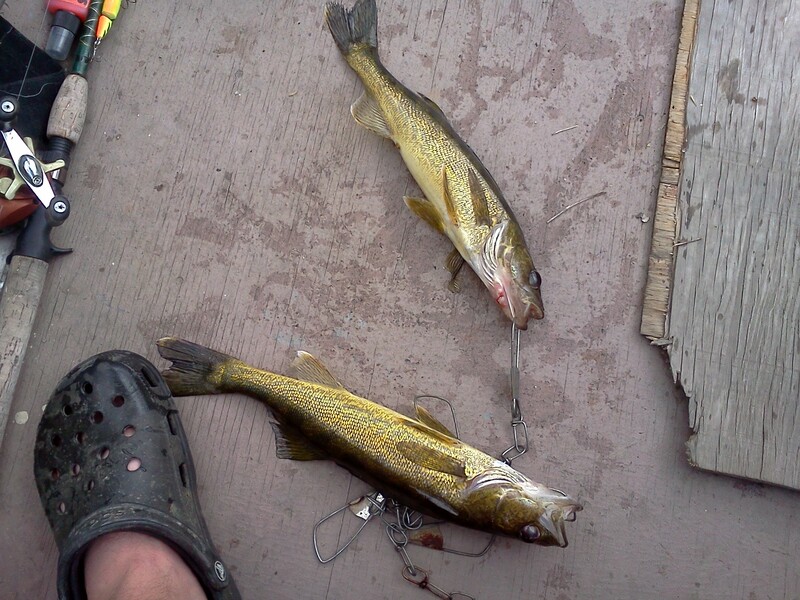 I could find no reason of why these fish were here other then the bait was there. The fish were cold when you brought them in meaning that they are just starting to make their move into warmer water. 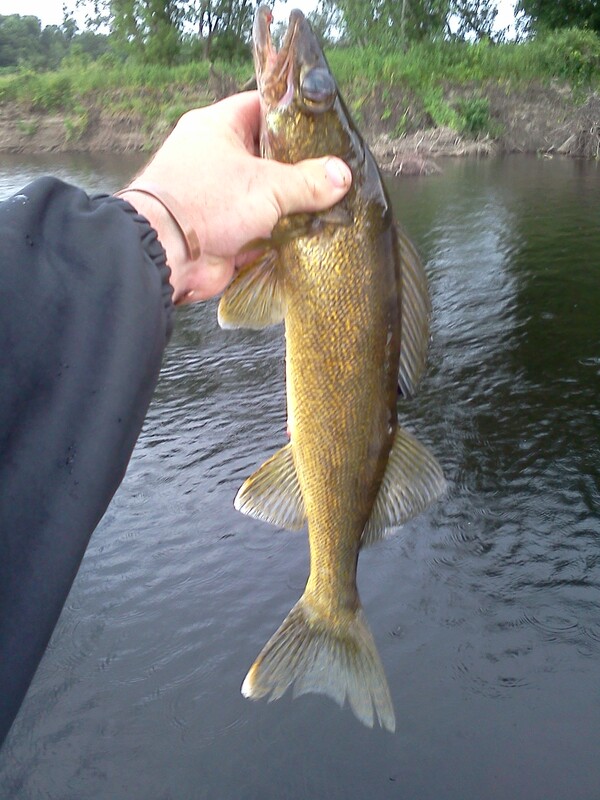 There was no need to jig the bobber in yesterday because the chop on the water did that for it. I had a hard time at first getting bites. I tried different retrieves and finally hit on a keeper. I was getting bite more frequently on a slow retrieve, enough that the bobber remained on the surface. Bait selection was tricking. 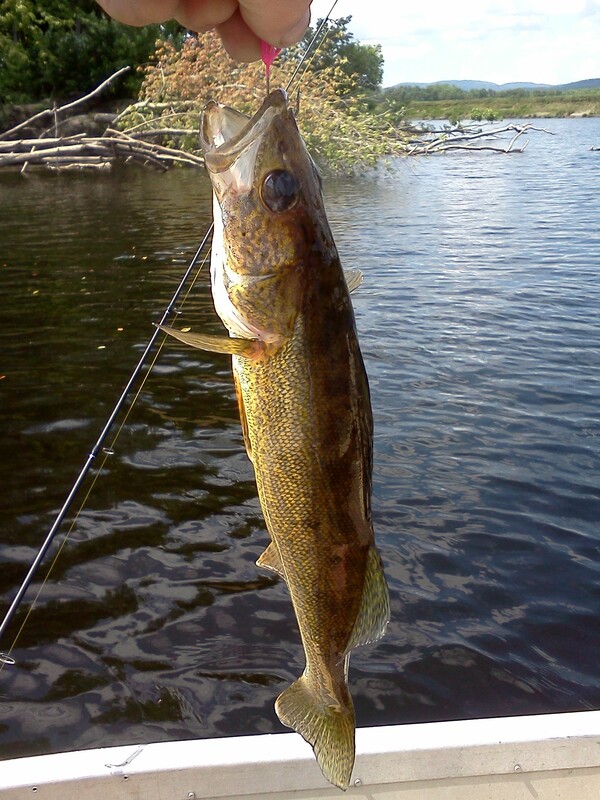 The best bet was a 1/16 oz jig head in fire tiger, tipped with a Berkley Gulp Minnow in their smelt pattern. I ended the night with 21 nice fish in my bucket. This is the word to the wise part. When the weather is still cold and there is no need for a cooler I use my ice fishing bucket to hold my fish. Nothing more than a bucket with a seat and a crappie checker on it. Well in our rush to leave and attempt to move all of our gear in one trip. We managed to get everything between the two of us but I made a huge mistake! I proceeded to carry my bucket with 21 slab crappie in it by the seat, which is always a pain to get off so I thought it would hold. Guess what? It didn’t. 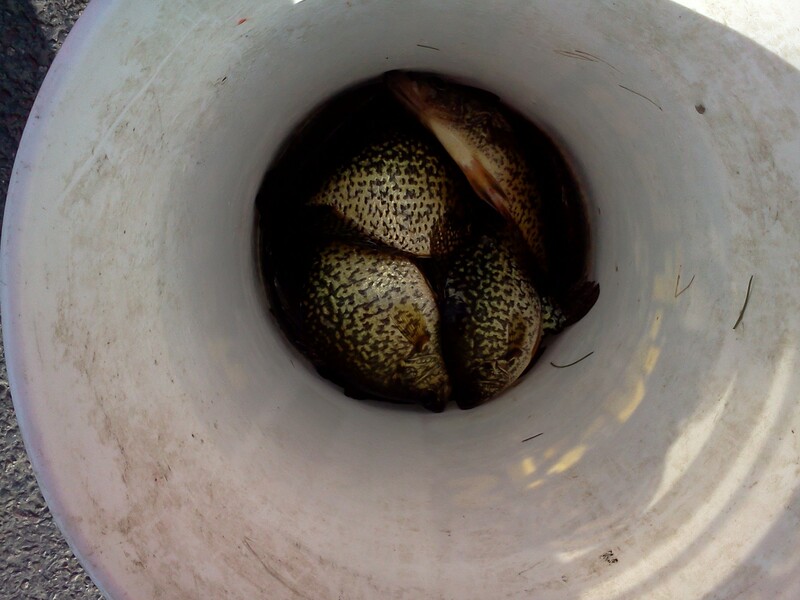 In one fell swoop the bucket crashes to the dock and 8 nice crappie which are still alive get a second chance at life. Lesson learned! Still had a great time for only a few hours of fishing, Thanks to Scott and Dody! 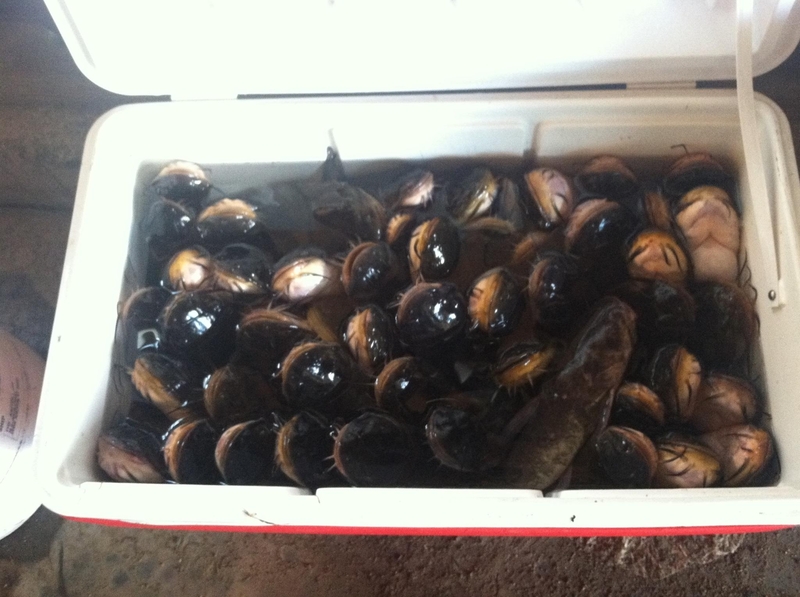 The bucket of live fish after the disaster! 3-20-12 – It’s All Fun And Games Until Someone Gets Hurt Then It’s Fun Again! Today was a two part day on Lake Champlain. I began the day in the islands ditch fishing for bullhead. 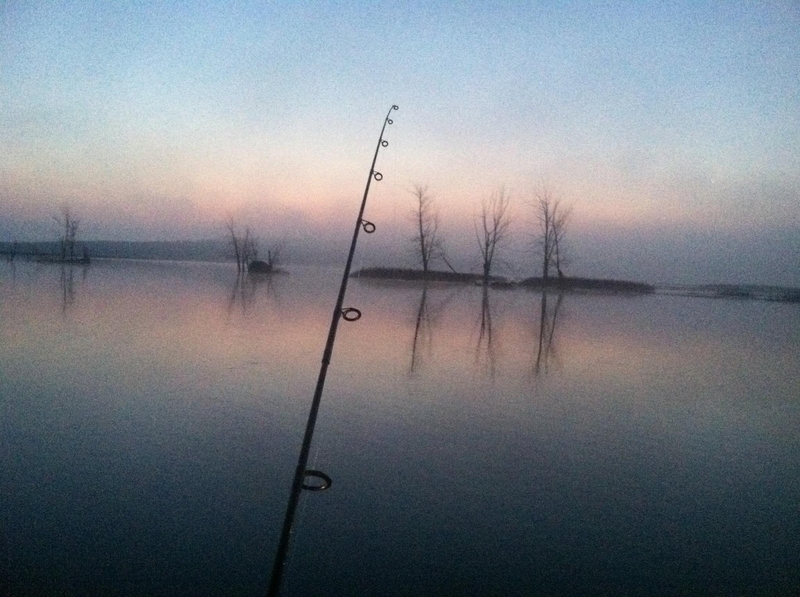 The setup for this type of fishing is simple. I run a 1/2 -3/4 ounce bell sinker with two snelled hooks in line spaced out above the weight. 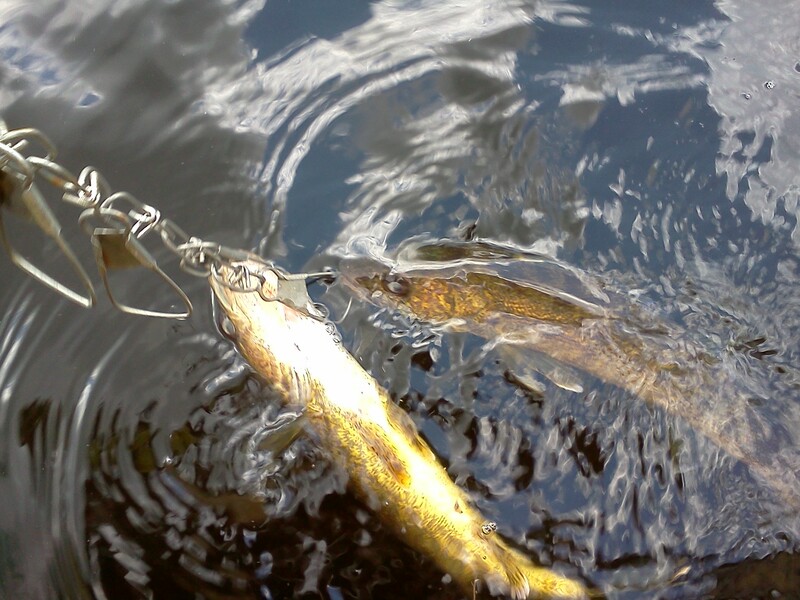 The height of the hook depends on where the fish are running but a good place to start is with the first being tied in 6″ up and the second 6-10″. We used worms and Powerbait with success on both. In general, we caught more fish on the worms. My first cast with Powerbait on yielded a good crappie that measured in at 12.5″! The bullhead shut off early in the day as the sun came up and only bit sporadically for the remainder of the morning. Comparing this year to last, the fish seemed to be in fewer numbers (could be timing of the run in regards to my trip) and larger in size. We caught some huge sunnies and loads of perch. The numbers of perch were unreal! We were all pulling doubles throughout the day! Just being there for the sunrise made the trip with it. For the afternoon part of the trip, I met up with bobby for a ride to southern Lake Champlain chasing crappies from a boat with Jamie. We left the launch around 2:30pm and headed to a spot that had been producing. We quickly got into the fish but found a lot of smaller sized between the keepers. We spent a few hours picking through the before it slowed down. During the excitement while in a run of big fish I stubbed my toe. The nail got jammed back and is completely black and blue now. I think it may have broke. Didn’t stop me from fishing the rest of the day though! This spot in particular is very tight as it is surrounded by low hanging trees and with just enough room for a boat to squeeze in. Because of the space limitations, we were using our ice rods by Austin Custom Rods for much of the time. It is a blast pulling in a slab that can run where ever it wants to! On the way back to the launch, we decided that we should try another spot that had given up a few fish in a past year. 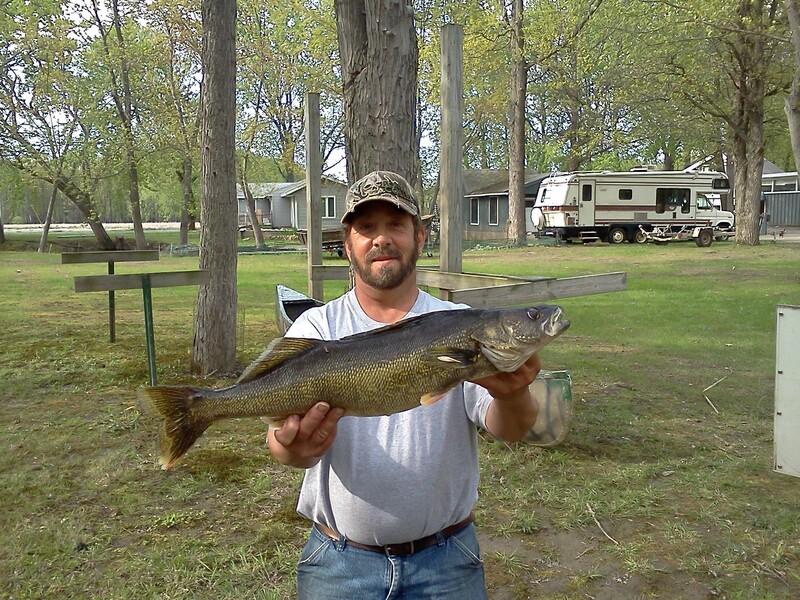 It was a slow bite producing only pike, bass, and bluegill. The fish were exploding everywhere chasing bait. Even though we were all ready to go we motored a short distance to a third and final location. This spot had great results. For an hour, we pounded slammers. 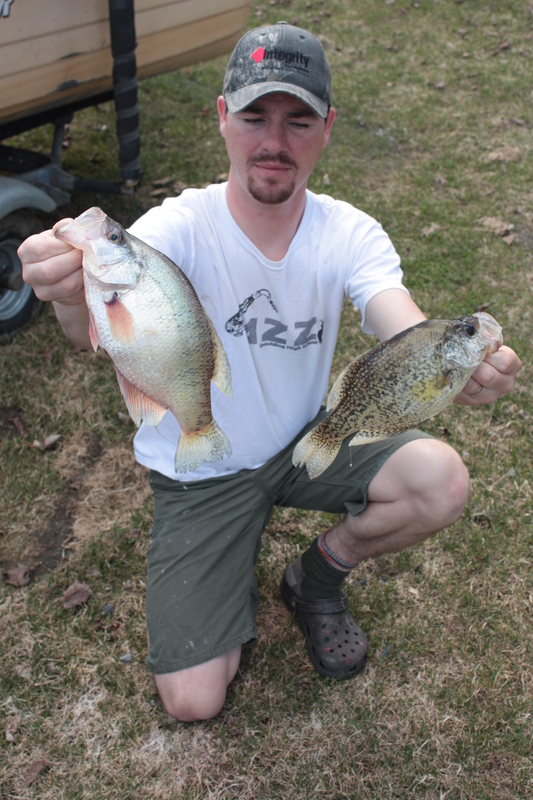 We were throwing back 11″ crappies because those were the “small” ones! We all ended up with some nice bags to take home for supper. Some fish for the freezer. 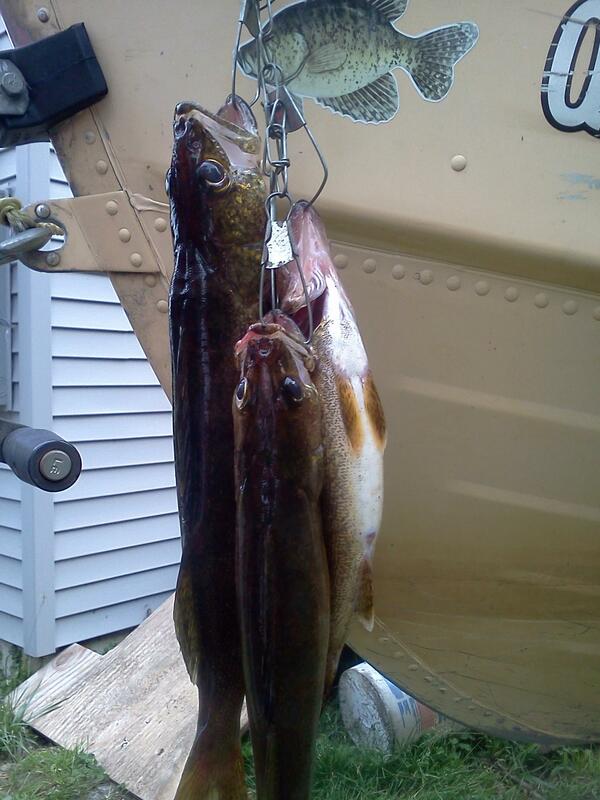 The weather provided us fishermen of Vermont with another spectacular day on the water! 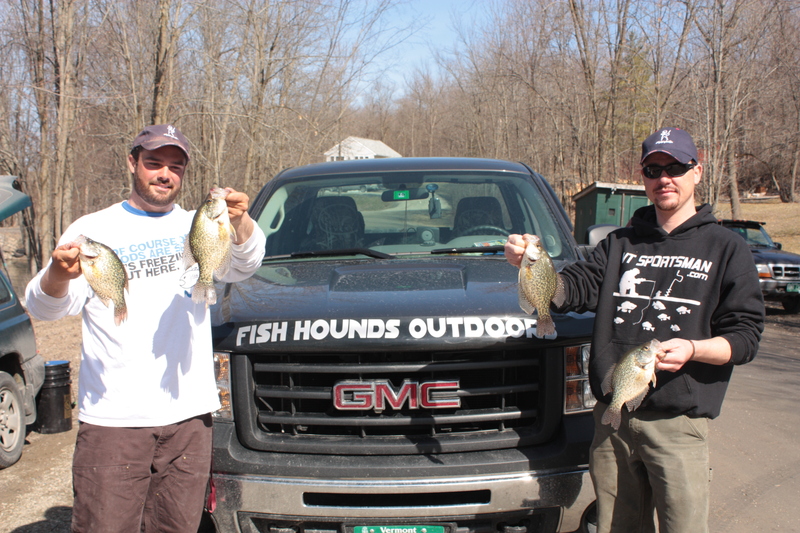 Blue skies, a light wind, and a long spring day graced us with ideal conditions for landing some some nice crappie and bluegill on Lake Champlain. 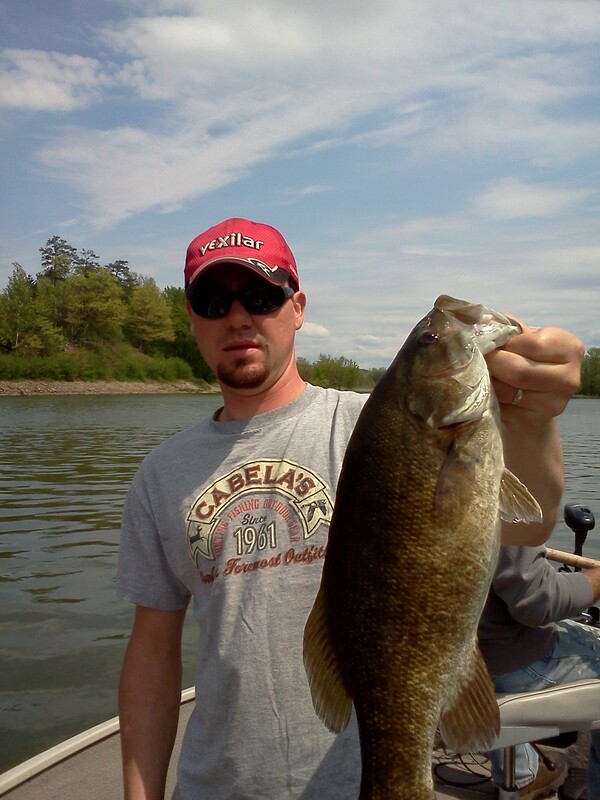 Although the fishing wasn’t as good as yesterday it sure beats the hell out of work! I am going to struggle when I actually do get back to work. For now, the time is ticking and I’m not wasting it… I’ll be back out the next two, maybe three days! I was set up for fishing around 6:30am and there were already good numbers of people around. The fishing only provided a few good runs of crappie for the entire time I was there but it was possible to pick them throughout the day. It is a blast when there is a good run going on and people are swarming to the action. Seeing like 10 bobbers fighting for real estate in a hula hooped sized area is a riot. Its amazing there aren’t more big knots tied across the water. 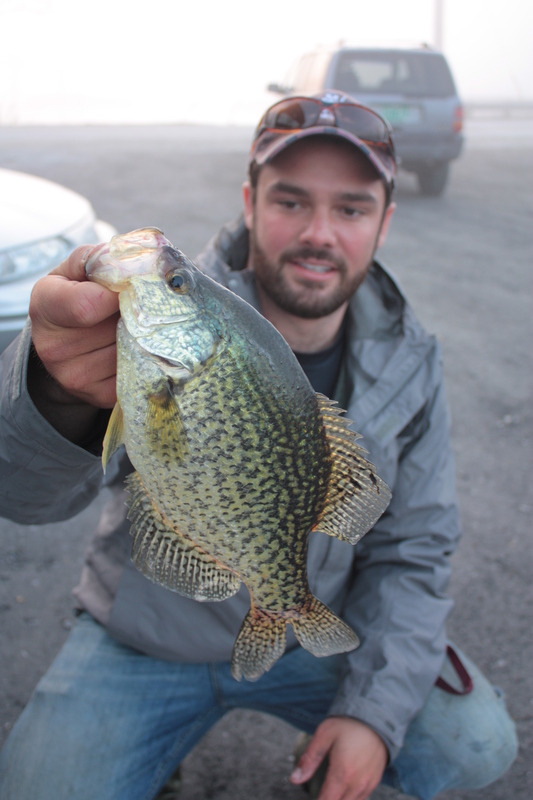 I found myself catching a lot of fish in the 8-9.5″ range but saw some real slabs get pulled. The set up today was pretty much identical to yesterdays. I ran a bobber with 12-15″ of like under it. I switched between maroon and white tungsten jigs a few times today. 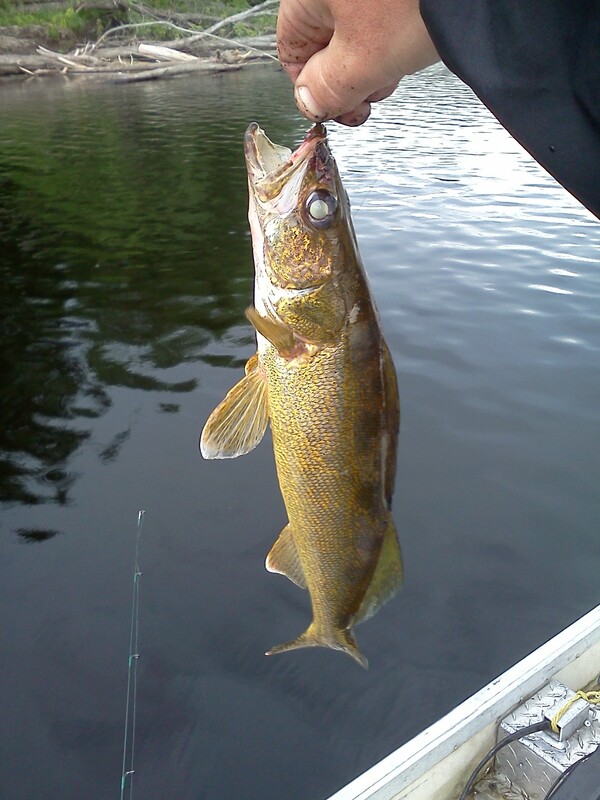 I used both Powerbait minnows in black and white and Mister Twisters in yellow and white all day. I never found a time when the fish wanted it deadsticked at all. Yesterday it went in phases for what they wanted. Most of the fish I caught today were gills and seeds. I did catch a few large hybrids that are always neat to see! Cleaning my fish tonight, I took some pictures showing how proceed. I till try to get it up within the next few days. Ideally, there will be some video to go along with it as well! Check back tomorrow for more action! 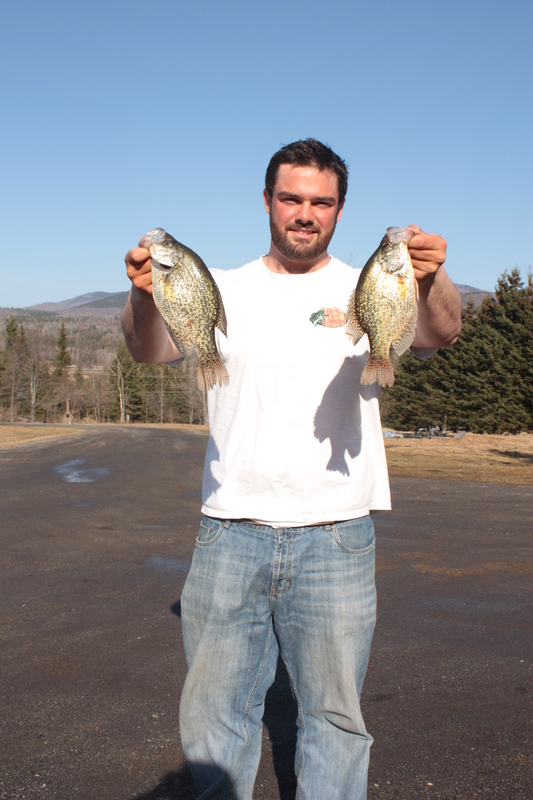 We hit the shores of Lake Champlain today fishing for staging crappie. 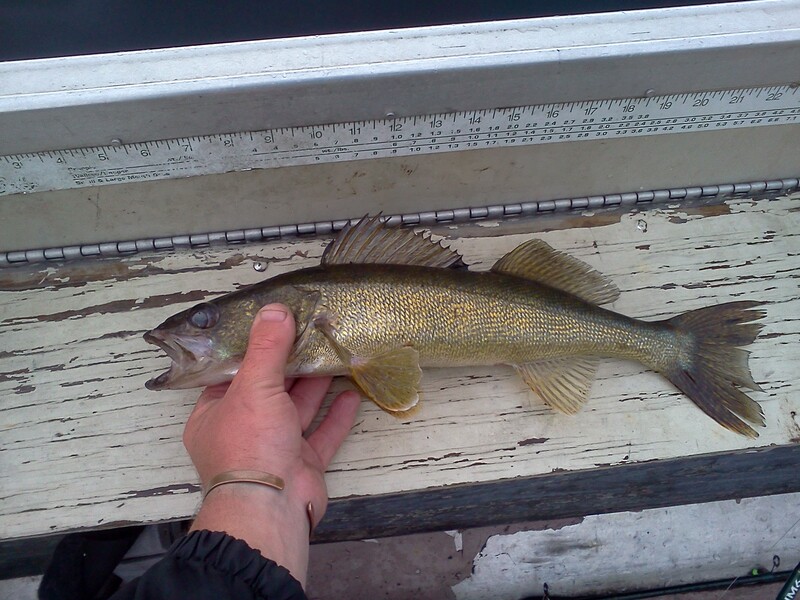 The water is low for the time of year but considering the weather conditions this past winter, there isn’t much water for a “spring runoff.” The water we were fishing was 3′ or less and warming up fast. The bite this morning for us was slow but as the day warmed so did the water and it turned the fish on. We noticed an increase in size of the fish as the day progressed as well. We left with our limits around 2pm after about 6 hours of fishing. 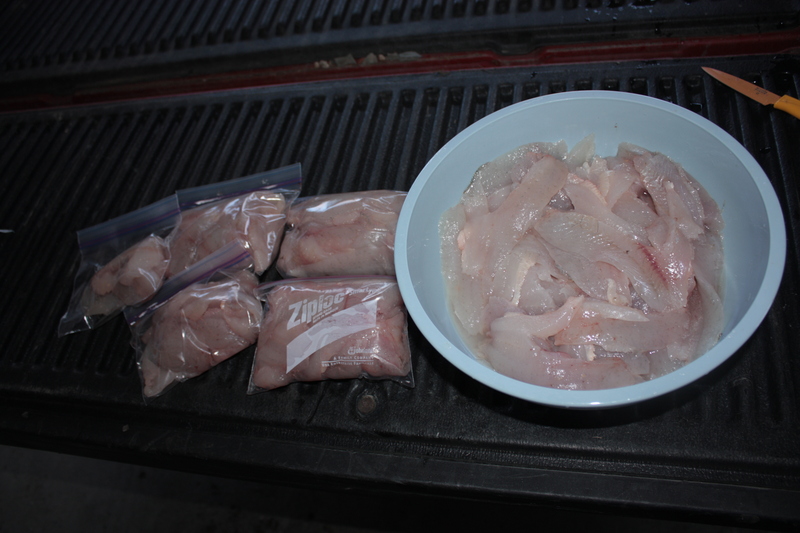 We discarded many of the fish that were of “keeper” size as the bite was decent enough. 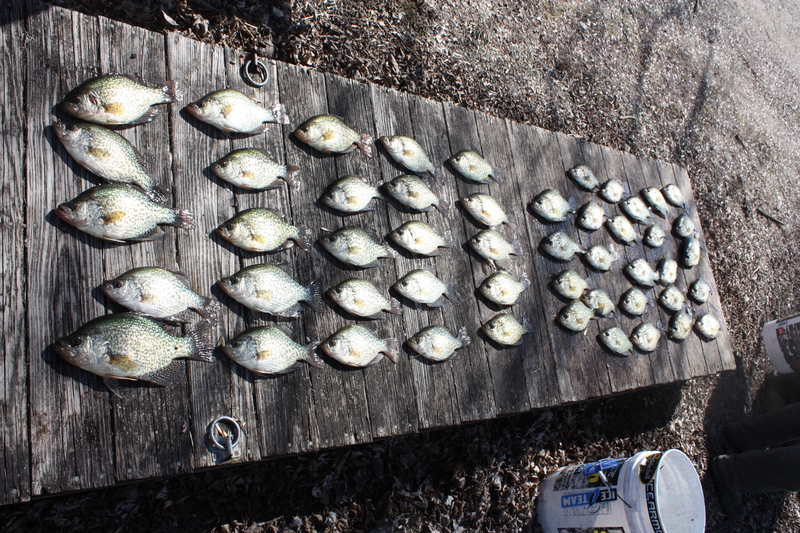 We found the best pockets of crappie to be in the shade but were most willing to bite on the fringe of the sun/shade area on varying colors. Mister Twisters and Powerbait minnows that were black and white placed about a foot under a bobber seemed to be our best options. Sometimes the fish wanted the bait moving while others it had to be still. It took time to get fish but when they came through it was very will possible to pull a few! 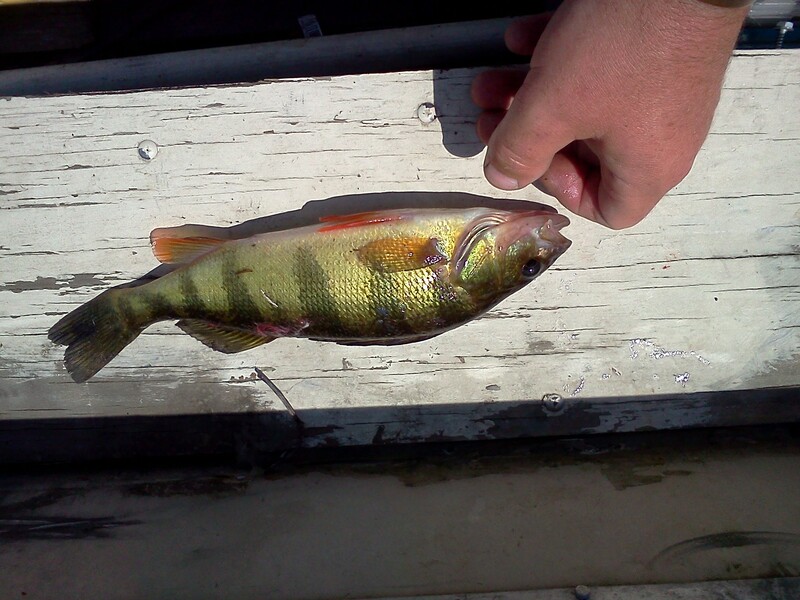 Other species we caught were perch, pike, pumpkinseed, and bluegill.